Maresco | Developer of Economic and Affordable housing in selected locations in or near Metro Manila. Our projects include subdivisions in Laguna and Cavite, as well pocket developments in Metro Manila. 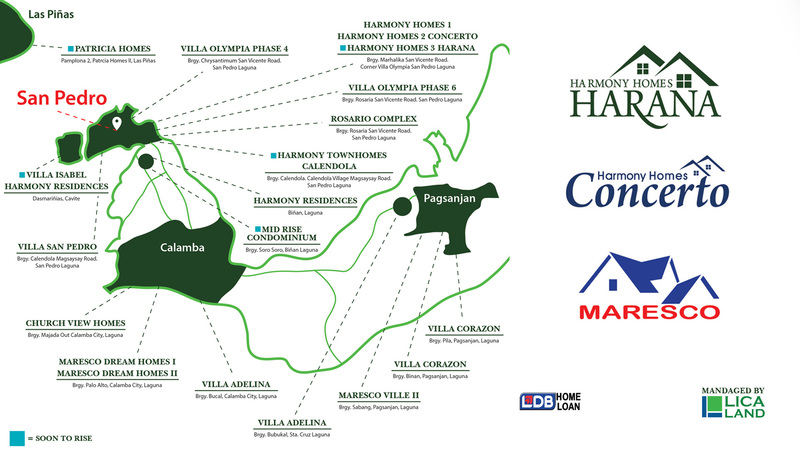 Harmony Homes | Affordable to Intermediate residential developments in Metro Manila and CALABARZON. Villa Olympia | Premium Lifestyle residences and buildings catering to investors and homeowners with higher end requirements. A serviced residence and commercial podium, DusitD2 Bonifacio solidly defines the posh way of life. Offering a combination of contemporary and cutting-edge design along with a refreshing vibe, modern convenience is within reach here at DusitD2 Hotel—located along McKinley Parkway and directly accessible from C5, a major Metro Manila artery. The podium has 4 parking basements, 3 retail, commercial, and amenities floors, including a private membership club. The 24-storey tower includes serviced residential units as well as private apartments. While keeping up with hospitality’s modern trend by establishing world-class facilities, DusitD2 Bonifacio fortifies the brand’s promise: to deliver an experience that enlivens the individual spirit, no matter what the journey. Somerset Olympia Makati is a world-class serviced residence that offers stylish, contemporary lifestyle for senior and upper management. It is strategically located at the heart of Makati City where business and pleasure mixes. It is managed by the pioneer brand in luxury-serviced residences in the Asia Pacific, The Ascott Group. The Ascott Group comprises of more than 13,800 serviced apartments across 16 countries in 39 cities. Its vision is to be the leading international serviced residence company with global brands, products and services that set new industry benchmarks.